An outstanding winemaker for one of the great Walla Walla wineries, Chris Dowsett has a longstanding history in the wine industry. With previous stints at famed Robert Mondavi, and Domaine Chandon, Chris eventually migrated north to become winemaker for Buty since 2009. Having made his first wine in 1983 from his family's vineyard in the Willamette Valley, Chris has amassed more than 30 harvests. His vast experience shows in every bottle of Buty wines. I recently had the chance to review some of his outstanding new releases and was highly impressed with the combination of richness and terroir with each wine. He is a very talented guy. 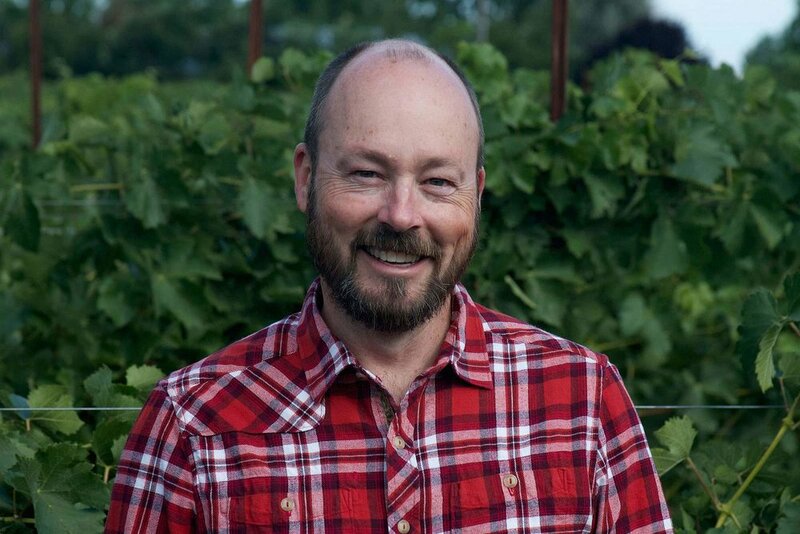 Here is my interview with Chris Dowsett, head winemaker of Buty Winery. WWB: Can you talk about your journey in wine before coming to Buty? Who were some of your initial inspirations? CD: I grew up in Oregon, and started in the wine industry through my family. We lived in an area of Portland that was slowly being overtaken by the suburban sprawl. My parents wanted to move farther out (west) and found a piece of property with an old house and 12 acres of vineyards. We had no experience in the industry, but worked to double the size of the vineyard and start a winery with some partners. The winery originally focused on whites and sparkling. We worked with Pinot Noir, Riesling, Gewurztraminer, Semillon and a variety of tiny lots of more obscure varietals. I was very inspired by some of the white wines of Champagne, Alsace, California’s Anderson Valley and Oregon. During the time I attended Oregon State University, I took an exchange to Roseworthy College in South Australia, to study wine science. This trip really opened my eyes to Rhône and Bordeaux style wines. Much of what I took for standard in Oregon was different there. The Barossa and Clare valleys of South Australia were areas I loved. I also loved the contrast of big wineries like Penfolds, with the newest technology and research, and smaller wineries, like Wendouree Cellars, that did not use any modern methods, but made amazing wines. I came back thinking that I needed to see more of the wine world. I spent five years in Napa and Sonoma working a few early harvests at Robert Mondavi Winery and Domaine Chandon, in both the vineyards and the laboratory. I decided to move into the cellar for permanent jobs at Schramsberg and finally J. Stonestreet Winery. In 1996, I moved my family up to Walla Walla to be assistant winemaker at Canoe Ridge Vineyard. After winemaker jobs at Latitude 46N and Artifex Wine Company (a custom crush facility), I joined Buty in 2009. WWB: You make some of the best Bordeaux style white wine in Washington. Can you talk about your special style of Washington ‘Bordeaux Blanc’; and the challenges of making wine in warm vintages? CD: White Bordeaux wines have long been of interest to me. I first started working with Semillon and Sauvignon Blanc in Oregon with. These were much different in that climate than Germanic or Burgundian grapes. They had more structure and grace than the more aromatic varieties. With my time overseas, I was introduced to aged Australian Semillon and fresh New Zealand Sauvignon Blanc. These were great discoveries. Once back in the U.S., I first started drinking Washington wines through the early Semillon releases from wineries like Covey Run, Snoqualamie, and Kiona. As my budget increased, I tried the Semillons from Chinook and L’Ecole #41, and the Woodward Canyon Charbonneau White Blend. I was always amazed by the way these wines would age in bottle. With the Buty white blend, we have established a style that we love. Semillon should be front and center, there is no influence of oak, and it should have a long timeline of enjoyment. We are looking to express the characters of the individual varieties, yet build a complex, complete wine of balance and harmony. The aim is to make a white wine that has richness and good acidity, not just one or the other. We have set up methods that help this plan. The vineyards are where all this begins. Our blend is usually at least 60% Semillon. Rosebud Ranches, in the Wahluke Slope, is our warmest site. It is also our oldest vines. These vines were planted in the late 1970s and are great for withstanding the warm summers. The wines from this vineyard have the classic characters of Washington Semillon: rich honey and figs, with a slightly apricot fruit profile. Boushey Vineyard gives us a more acid-driven profile from the cooler Yakima Valley. This fruit has a bit more golden apple and pear. Lonesome Spring Ranch, in the lower lands below Red Mountain, is where we get our two other varieties. The Sauvignon Blanc is used as an acid backbone to build the more aromatic wines around. It has a hint of grassiness and tropical fruit to complex the blend a bit. The Muscadelle is the amazing floral character that can make a young, tight wine open up from the first cool pour out of the ice bucket. I am looking in the vineyards for flavor and acid balance more than sugar levels. With our warm climate, we generally are working to keep the acids firm and the fruit ripe, without going too far. We do not add acid or water to the Buty wines, so there is much time spent in the vineyards looking for the perfect time to pick. In the cellar, we use mostly cool whole cluster pressed fruit, processed under blankets of carbon dioxide. Small amounts are fermented with more oxygen and no sulfur dioxide for complexity. We will take some small lots of Semillon and crush the clusters, and leave them on skins for 12-72 hours. This adds tannin and richness to the wine. We ferment a small selection of each lot in neutral barrels, with the majority going to a cofermentation of all three varieties in one of our two concrete cubes. We love how this piece of the blend ferments slowly and cool, due to the thick concrete walls absorbing much of the heat. We will age both the barrel lots and the concrete tank on the fermentation lees to again add body and richness. The concrete tank has a huge flat floor that gives lots of surface area to these lees, and does not need any lees stirring to get the benefits of the interaction of the yeast cells. We will leave some percentage of the wines without malolactic fermentation, to use for blending. The final step is the blending. I taste, with Nina Buty and Paul Boen, my assistant in the cellar, every individual lot of each variety, and then begin with very rough blends of the three. We fine tune over usually about four tastings a wine that expresses the best of the vintage, yet retains the style and soul of the previous blends. We usually go to the library and open a few of our favorites, or more recent vintages similar to the one we are working on. We are looking to make a wine that does not get its richness from tools like high alcohol, high percentages of new oak or residual sugar. The final product should be a complex, exciting wine that has enough energy and body to stand up to the cuisine we love in the Northwest, no matter what season of the year. WWB: Your 2014 Buty ‘Rediviva of The Stones’ Red Wine (WWB, 93) was a head-turning blend that had wonderful weight, poise and range. Can you talk about this special wine? CD: The Rocks District of Milton-Freewater is an amazing winegrowing area. It is an AVA that is totally designated by being in an alluvial fan of river rocks that was once the Walla Walla River. It is pure cobblestones going down hundreds of feet, in some areas. Nina first started working wine Syrah from The Rocks in 2000, with fruit from Cayuse’s Cailloux Vineyard. In 2006, we purchased 10 acres of land in the area. Seven acres were planted for the Rediviva of the Stones. We have three clones of Syrah, Cabernet Sauvignon, Mourvèdre, Grenache and a bit of a few Rhône whites. The vineyard is fittingly named Rockgarden Estate. When you grow in the Rocks District, the grapes get the heat of the warming rocks, as well as some sunlight reflection off the rocks. The resulting wines get more savory flavors than fruity characters. Syrah is what we love there. The profile is filled with spicy and gamey flavors, mixed with olives and smoke. We give some emphasis to these by slow, uninoculated fermentations, and no new oak. The Cabernet in the blend is actually lighter than the Syrah. It gives some floral characters and a bit of cherry to help keep the Syrah from becoming too much of a heavyweight. A touch of Mourvèdre brings a hint of pepper and a bit more to the midpalate. The tannins from growing on The Rocks are always long and silky. It is a big wine that drinks rich, not astringent or bitter. This wine is our expression of what we love in The Rocks. WWB: When you’re not enjoying Washington wine, what are some of your favorite wines of the world? CD: I have always enjoyed sparkling wines. Blanc de Noir Champagne usually is the direction I lean. The white wines of Alsace, especially Gewurztraminer, are my favorites. I also love blends out of the south of France: Grenache based Châteauneufs and Gigondas, Mourvèdre based Bandols. Red wines and Riesling from the Clare Valley of Australia are great wines when I find them. Pinot Noir can be a great complement/contrast to some of the big reds we do so well here in Washington.